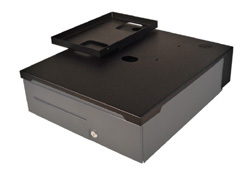 The Caddy™ SP Organizer is a slim profile POS integration tray that brings easy cable routing and organization to APG heavy duty cash drawers. Several different printer tray sizes can extend the work surface with secure locking tabs in just seconds. Cables and the printer power supply fit easily into the cable routing cavity. The Caddy™ SP Organizer is sturdy enough that it can be lifted off the drawer even when it is fully populated.